5.80 points at 15 votes (rank 674). 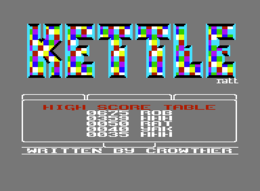 In this skill game by Alligata Software you take over the role of one or two kettles that are caught in a labyrinth, from which they need to escape. Equipped with a propeller and armoured with tea bags they start their journey. The labyrinth consists of 30 levels (stages), which are divided by a metal door. The aim of each level is to find the key and collect as many points as possible on the way to the exit to finally leave the level. The keys are in one of the clay jugs that are standing around. But you need to be careful. 2nd a mean monster can hide in these jugs, which will now chase use. Furthermore, you should keep away from the walls, because these also cause energy reduction. Some rooms are separated from each other by very narrow tunnels and can only be reached with well tuned movements or a great energy loss. The game ends when you have crossed all 30 levels or used up your life energy. The scrolling is smooth and the sprites are well-animated, in return, the background graphics are kept simple and hardly change during the different levels. 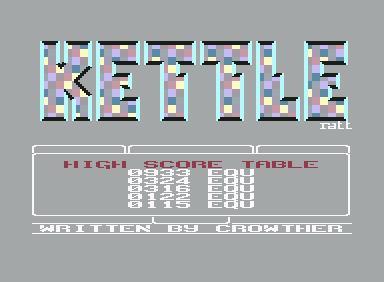 Nevertheless does KETTLE distinguish itself by a fully developed 2-player mode (simultaneous in split screen), a heavily motivating gameplay and the great soundtrack by Ben Daglish. When in the 2-player mode one player has reached the next level and the other one does not follow within 15 seconds, the game ends. 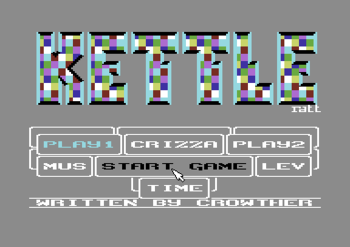 Try and click the word „ratt“ or „Kettle“. 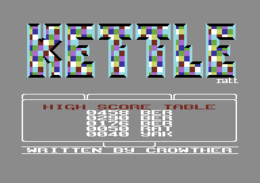 Player One is the red kettle in the upper half of the screen. The corresponding score and energy display is at the lower left. 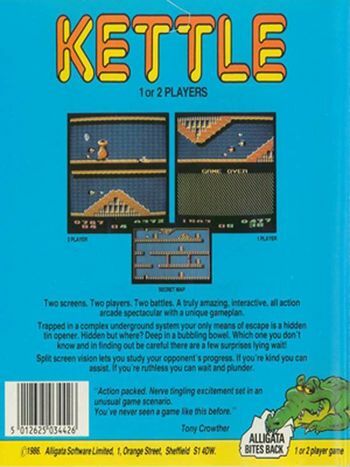 Player Two is the green kettle in the lower half of the screen. The corresponding score and energy display is at the lower right. 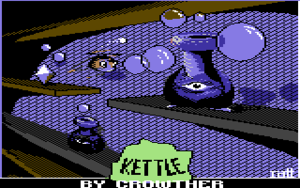 H.T.W: "Two kettles equipped with propellers and throwing tea bags try to escape a labyrinth... I wouldn't have come up with this!! idea in a million years!! A somehow funny game in its own way, the split screen mode for two players is successful". Bergo79: "I have just loved this game at that time, especially in twos....9 points from me." Robotron2084: "Dreary, repetitive and flawed inexplicably in the controls if you want to steer into the opened tubes. 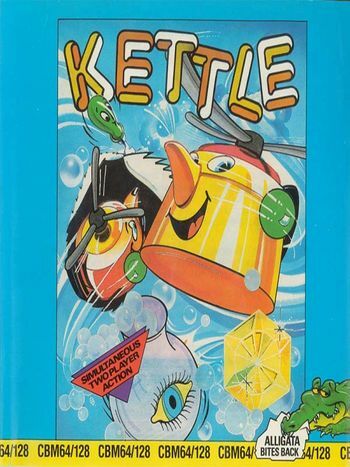 Kettle seems to me somehow to be unfinished and unidimensional, the scenario might be quite inventive, but that is all. One of the most boring shooters that I know, what a pity for the really great music. 4 out of 10 points." This page was last modified on 15 April 2016, at 18:24.